GENEVA — When not snapping pictures for weddings and graduation photos, local photographer Neil Sjöblom takes award-winning artistic shots — one of which recently earned him one of the industry’s highest honors. Sjöblom (said show-blum) captured the Kodak Gallery Award, top prize at the 101st annual Professional Photographers of New York State convention, that was held March 17 to March 22 at the Nevele Grand Hotel in Ellenville. He also came home with three blue ribbons in the Masters Print category. The Kodak Gallery Awards are the “Oscars of the industry,” he said, and he was elated to receive the award.“It’s always good to be recognized by your peers, especially since these are the most prestigious awards in photography,” said Sjöblom, owner of Neil Sjöblom Studios in Geneva. Sjöblom shot his winning entry, “Demon Eyes,” in Venice, while he was attending a 30-year reunion of a Hobart College study abroad session. 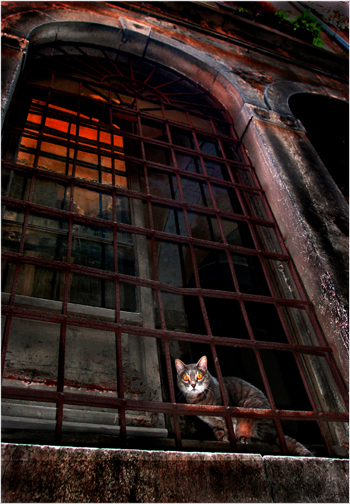 “The cat is sitting in such a foreboding setting, the whole thing looks so ominous,” he said.After using a computer program to modify the photo andgive the eyes a little more glow, Sjöblom entered the print in the contest at the insistence of his brother, Steve. His two other blue ribbon entries were “Venice Palette,” a cityscape of the “very colorful place,” and “Castle Rock,” a picture of the Canadian Rockies he took while skiing at Lake Louise on a recent vacation.For Sjöblom, the award marks a high point in his photography career, which has spanned roughly 40 years. He inherited his interest in photography from his father, who he said made pictures as a hobby and while working on crime scenes as a New York State Trooper.His first foray into the business was in 1968 when, as a high school student, he helped the then-Geneva Times photo editor, Bill Ahlstrom, develop film. “I’ll always remember when I got an envelope with $20 in it from the Times at Christmas,” he said. “I remember thinking, ‘Wow, I can do anything I want with this, I earned it.’”Sjöblom earned a degree in art at Hobart in the 1970s and opened his shop soon after. Since joining the state professional photographers association, he has attained master status, having won more than 25 blue ribbons. In 1998, he was awarded a Master of Photography degree by the Professional Photographers of America; and the state association presented him with its State Award in 2001 for his contributions to its workshop, which is conducted each year at Hobart and William Smith Colleges.